Grand Coulee is located in Grant County within the upper Columbia River Gorge of Central Washington and on the shores of Lake Roosevelt. This rural community of approximately 5,000 in the hospital district is home to the largest concrete dam in North America and lies adjacent to Lake Roosevelt which stretches nearly 150 miles, almost to the Canadian border. Additional information about the community can be found at www.grandcouleedam.org. Dr. Castrodale graduated from UW School of Medicine in 1994 and completed his residency at Family Medicine Spokane Residency Program, graduating in 1997, and completed an OB Hi-Risk Fellowship in 1998. He has practiced at the Coulee Medical Center since 1998. Family Medicine: Shannon Servin-Obert, D.O. General Surgery: Mohammed Fercha, M.D. • Sam Hsieh, M.D. Endocrinology, Diabetes & Metabolism: Elizabeth Hsu, M.D. Radiology: (Radia Tele-radiology) Linda Strand, M.D. Clinic: The clinic serves a large, culturally diverse population base. The facility is part of the newly constructed medical center and is staffed by two family physicians, two general surgeons, three ARNPs, 2 PA-C and one endocrinologist. Visiting specialists offer regularly scheduled hours in the Coulee Family Medicine Clinic. The staff has received high praise from Rural/Underserved Opportunities Program students, as well as the Family Medicine Residents and ARNP students who are hosted by the clinic. The staff is enthusiastic about rural medical education and encourages students to pursue primary care, which offers the most variety and challenge. This site also precepts RUOP (Rural Underserved Opportunity Program), TRUST (Targeted Rural Underserved Track), and Family Medicine clerkship students. Hospital: The Coulee Medical Center is a 25-bed critical access hospital offering services in general medical & surgical care, OB (100 births per year), an emergency center, and a long term care unit. The hospital provides a variety of inpatient and outpatient services and is involved in several community outreach health programs. In 2010, Coulee Medical Center relocated into a new, state-of-the art $18.3 million facility that houses both the hospital and the Coulee Medical Clinic. In 2009 the hospital was recognized as one of the top 100 Most Wired Hospitals in the nation. The hospital’s web site is www.cmccares.org. Nursing Home: Located in the Coulee Medical Center. 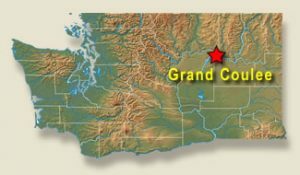 Grand Coulee is located 80 miles west of Spokane, 230 miles east of Seattle, and 100 miles south of Canada. To see a map of where we are located and/or get directions from other locations, go to maps.google.com (for directions, click “Get Directions” in the upper left-hand corner where you can input the starting address). Transportation:Travel to Grand Coulee is easiest by automobile or bus; the nearest commercial airport is Spokane. Housing: Housing accomodations are shared in hospital-owned housing. The great floods carved out a “coulee” revealing a stunning display of layers of basalt rock, hence the name of the city. In addition to this geological wonder, the Grand Coulee Area offers many adventures for outdoor enthusiasts. Lake Roosevelt and Banks Lake are two of the most beautiful and vast lakes in Washington. Fishing, boating, swimming, picnicking, and water sports can be found on both of these great reservoirs. The coulee walls and unique landscape of the area offer excellent hiking trails and rock climbing. The area also offers abundant wildlife and bird viewing, nature walks, camping, hunting, horseback riding, and golf. The Grand Coulee Dam Project began in 1933 when President Roosevelt included Grand Coulee in his public works program to ease joblessness, provide irrigation to the surrounding desert areas, and for the production of electricity. Built from 1933 to 1975, it is 550 feet tall, from the 500 foot wide polished granite base, to the 30 foot wide crest which supports a paved two lane road. When you include the third power house, Grand Coulee Dam is almost one mile long and more than twice as tall as Niagara Falls. It is the 3rd largest producer of electric power in the world and the largest concrete structure in the US. The reservoir behind it is called (Franklin Delano) Roosevelt Lake. In the summer, the nightly laser show has become one of the community’s leading attractions. July is the hottest time of the year with temperatures from 60-89°; January is the coldest time of the year with temperatures from 20-31°. Precipitation is fairly low except during the winter months where there can be as much as 15” of snow on the ground.